The AC/DC switching power supply line-up from Tumbler Technologies + TRUMPower has been upgraded with the Class I/II TMC300 series, which has BF rated outputs. Specifically designed for medical applications, it is capable of delivering 300W of continuous output power at 10 CFM forced air or 200W at convection cooling. Standard form factor is an open frame PCB in a low profile 3” (L) by 6” by 1.38” (H) package. L-bracket form factor and enclosed frame with cooling fan versions are also available. It has an active efficiency of 87% and features a power factor of 0.98 typical with active PFC. Power consumption in standby mode is less than 1W at standby power 5V/100mA. Features include Power Fail Detection (PFD) and remote inhibit which will allow the designer to pack in additional safeguards to protect the patient and the operator. Remote sensing capability is standard across all models in the TMC300 series which can be used to regulate the voltage on the device side rather than its own output terminals to compensate for the voltage drop caused by the resistance of load leads, relays and connectors. 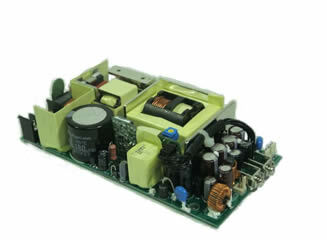 The BF rated power supply provides 2 MOPP between input and output, and 1 MOPP between input and ground. The TMC300 series can withstand voltage of 4,000V AC from input to output, 1,500V AC from input to ground, and 1,500V AC from output to ground. The series includes seven standard models of single 12V to 48V Power Supplies each with an actual earth leakage current measuring 143μA at 264V AC, 63Hz. Output voltage is factory pre-set specifically to meet the user’s request.